Yesterday, December 30, Region 2 of the EPA sent 17 pages of formal comments to NY State Department of Environmental Conservation (DEC) regarding proposed rules for drilling in Marcellus and shales. According to the EPA, the DEC needs to review and expand their analysis on the cumulative and indirect impacts in the draft Supplemental Generic Environmental Impact Statement (dSGEIS). In addition, says the EPA, "greater emphasis needs to be placed on the potential health impacts that may be associated with gas drilling and hydrofracturing." EPA is particularly concerned about the potential risks gas drilling poses to the New York City watershed. Despite the mitigation measures proposed in the SGEIS, EPA questions whether drilling in the NYC watershed is consistent with the long-term maintenance of the unfiltered water supply. In addition, EPA lists a number of other issues of particular concern: water supply, water quality, wastewater treatment, local and regional air quality and management of Naturally Occurring Radioactive Materials (NORM) disturbed during drilling. The EPA monitors plans for disposal of water and brine containing NORM. In their comments, however, EPA notes that NORM concentrations in production brine of Marcellus wells have the potential to far exceed the Maximum Contamination Limits (MCLs) specified in the Safe Drinking Water Act (SDWA). So if brine is going to go through pre-treatments and end up eventually discharged into somebody's drinking water, EPA wants New York to figure out how to meet the federal regulatory levels. They also question the inconsistency of reporting concentration levels; levels of some radionuclides are reported in pico-Curies per gram (pCi/g) while others are reported in parts per million (ppm). Using ppm as an analytical tool could "significantly underestimate the uranium concentrations," says EPA. The EPA also notes that the dSGEIS supplements the existing 1992 GEIS. But in the 17 years since the GEIS was written, the "existing environment and conditions in New York State have changed significantly". Reliance on the original GEIS as a "baseline" does not take into account the cumulative impacts fom habitat fragmentation and other impacts that may have occurred during the intervening years. It's hard to be a member of the Sierra Club when there's billions of cubic feet of natural gas trapped in the shale beneath your feet. That's because the national Sierra Club supports the production of shale gas as a "bridge fuel" while waiting for the development of wind, solar and other renewable fuels to catch up. Not only does the Sierra Club support the use of natural gas, they've become it's biggest cheerleader - not to mention an adoring fan for the gas companies. According to Wall Street Journal writer Ben Casselman, Sierra Club executive director Carl Pope has been spotted traveling around the country promoting natural gas's environmental benefits with none other than Aubrey McClendon, chief executive of Chesapeake Energy Corporation. Mr. Pope believes that increased drilling for natural gas - with the "appropriate safeguards" - is the best way to get the country off coal, which he sees as a greater environmental threat. A lot of folks living over the shale disagree with Mr. Pope. The are concerned about the tremendous volumes of water that will be used to drill the wells. They worry that the chemicals used in hydraulic fracturing (fracking) may contaminate their drinking water and the water they use for irrigation and livestock - either through surface spills, leaking cement casings, and other accidents. They wonder whether they'll be left with the enormous bills for road repairs, subsidizing corporate profits at taxpayer expense. There are a lot of ways that energy companies could make their drilling practices safer for the environment. They could use "greener" fracking chemicals, recycle flowback and implement a host of other "best management practices". And perhaps that is what Carl Pope has in mind. There is one thing that the greenest drilling practices simply can't address however: the industrialization of what is now rural and small town America. While the Sierra Club considers the environmental impact of a few wells they are blind to the larger picture - to extract natural gas in the most efficient manner will require a lot of wells. Right now the NY Department of Environmental Conservation (DEC) and the industry are talking about 640-acre drilling units with multiple wells at each well pad. Something like 8 to 16 wells that go down a couple thousand feet and then extend horizontally for up to a mile or more. But some folks in the industry say that is just the beginning. As gas production declines over time, the companies will drill more wells in the area, shrinking unit size to 80 acres. That cumulative impact is what folks like Carl Pope are missing. Which is why local environmentalists wonder why they've been abandoned by one of the oldest and most prominent conservation groups in the country. At least Trout Unlimited gets it. You can read Ben Casselman's WSJ article here. You can read Trout Unlimited's position here. Today, public interest groups and the Town of DISH released the final results of a health survey of area residents focused on the impacts of Barnett Shale gas infrastructure. According to the results, over half of the health complaints can be attributed to toxics first revealed in September in a DISH-commissioned study of area air quality. Now the residents in DISH, along with Earthworks and the Texas Oil & Gas Accountability Project, are asking state regulators to take action. They want the state to perform an in-depth health investigation, implement continuous 24-hour emissions monitoring, and establish a same-day community odor and symptom tracking system. Earthworks launched the health survey in September, after Wolf Eagle Environmental and the Town of DISH released air-sampling results showing that neurotoxins and carcinogens exceeded the state regulatory limits. The Texas Commission on Environmental Quality promised to do their own air sampling and should release a report later this month. And the Dept. of Health Services plans a health investigation in 2010 to analyze oil and gas impacts. You can read more here. Just one month ago the NY Office of the Attorney General announced that some landowners would be able to renegotiate the terms of their gas lease - or get out of their lease altogether. In an agreement between Fortuna and the OAG, the gas drilling company promised to stop using misleading tactics to unilaterally extend leases on properties. They also agreed to pay $192,500 to the state to help settle the matter. “Drilling companies will not be permitted to use misleading letters and dubious legal claims to bully landowners,” Attorney General Andrew Cuomo said. “Many of these companies use their size and extensive resources to manipulate individual property owners who often cannot afford to hire a private attorney,” he said, adding that this type of land-grabbing practice must stop. Back in April, Fortuna sent letters to hundreds of landowners whose natural gas leases with the company were about to expire. These letters falsely stated that Fortuna had the right to extend these leases without the permission of the landowners. 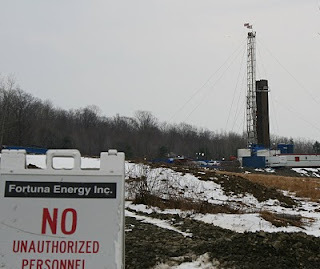 Fortuna claimed (falsely) that the leases contained a provision that allowed them to put the lease on hold until the New York State Department of Environmental Conservation (DEC) got around to issuing permits for horizontal drilling in the Marcellus. But, says the OAG, most landowners’ leases contained no such provisions. In these letters Fortuna offered landowners 30 days to extend their leases for an additional three years, with a small increase in the royalty. Landowners choosing to not extend their leases would be sent a “Notice of Force Majeure”, and Fortuna would file the notices with county clerks as well. That would prevent landowners from freely negotiating drilling rights with other companies. Not only did landowners feel that these letters were corporate bullying, but they also felt that the gas companies who were threatening Force Majeure were giving new meaning to the concept of "we can't drill." You see, no one was preventing gas companies from drilling vertical wells, and there are plenty of other gas-bearing strata in the area. Not only that, other companies were actively drilling. The letters motivated enough landowners in one county to seek assistance from the OAG. They wrote to the Attorney General, sending along copies of what they felt were misleading leases. Some wrote multiple letters, but eventually the OAG paid attention. Give Fortuna credit for sitting down at the table with the OAG, because they certainly aren't the only player in this game. Chesapeake also sent out similar letters this summer, and so far they haven't come to the table with the Attorney General. Not only that, Chesapeake decided to try extending the old 10-year leases they bought up a few years back. Some of these leases were so old that when they were signed the going rental rate was $3 - $5/acre. So, when the landmen filled out these leases, they left blanks instead of penning in an extension of the lease term. Back in 2008, Chesapeake decided they would not extend the leases beyond the primary term, and sent letters to landowners saying so. But what a lot of difference a year makes! This July Chesapeake changed their mind and told landowners that they would extend the leases - keeping to the original terms, of course. So while their neighbors were negotiating deals close to $3,000/acre, Chesapeake was threatening to extend leases up to an additional decade at three bucks an acre! Then, this fall, Chesapeake began sending out checks to landowners to “continue and extend for another year” their leases. Even if the landowners don’t cash the checks, they were led to believe that their lease would be extended. Now with the possibility that DEC will begin permitting wells in a couple months, the land grab has begun in earnest. Landmen are once again going door to door with their notepads full of company leases. And, according to folks they've visited, they're using the same pressure tactics. Read more about force majeure here. What to do With Drilling Wastewater? Use it again! Whether you are pro-drilling or not, the issue that tops discussion about Marcellus gas wells is what to do with the water. You know: the frack flowback and, after that, the brine and other water produced by the shale formation. Part of the reason a conventional drilling site requires a large well pad, says Schoonover, is they've got to have somewhere to hold the drilling slurry and other wastewater coming out of the well. Drilling a vertical well into Trenton Black River and other formations takes close to 350,000 gallons of water and fracking fluid. The horizontal drilling and fracking required to extract natural gas from the Marcellus Shale will require million of gallons - somewhere between 3 and 5 million gallons of water per well. The water will come out of our local rivers, streams, lakes and ponds and will most likely be trucked in by large tankers. Add to that the tanker trucks needed to haul off the wastewater and you've got about 1,000 truck trips on our country roads (closer to 7200 for an 8-well pad). Not only is that a lot of wear and tear on the roads, but it's a lot of fuel going up in exhaust and a lot of water. A closed loop system offers an opportunity for on-site wastewater treatment. The process involves separating solids from liquids, using both mechanical means (shaking and screens) and chemical means. A centrifuge spins the water out of the solids. Then the water can be stored for re-use in the drilling process. According to the EPA, drillers using this method see an 80 percent reduction in use of water. Schoonover pointed out that re-using water could reduce truck traffic nearly 75 percent and would eliminate the need for reserve pits. A study by OGAP (Oil & Gas Accountability Project) of two wells in Matagorda City, TX backs up Schoonover’s figures. The wells were drilled 200 feet apart. One used closed loop drilling and the other used conventional drilling with a waste pit. The two wells were drilled into the same formation, and used the same crew and the same drilling rig. The well using the closed loop system not only saved 43 percent in costs for drilling fluids, but they also saved money on drill bits and the drillers finished the job quicker than the conventional well. Just how much money can drillers save using closed loop systems? Try $11,000 per well. It's a money-saver, says Schoonover, and it could reduce pollution associated with gas drilling. Not only that, BLM lists closed loop systems in their best practices. You can read Broader View Weekly's article on closed loop systems here and ProPublica's article on better drilling practices here. How to protect Bridges and Roads once Gas Drilling begins? That's the question that town board members and highway superintendents have been puzzling out for the past few months. Highway superintendents from towns across our county have been meeting with town and county attorneys to discuss everything from crafting road laws to developing road use agreements. 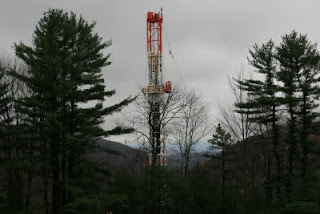 The problem: once the NY Department of Environmental Conservation (DEC) adopts their rules for drilling in Marcellus and other shales, the drilling rigs will begin to move into NY in earnest. While no one knows how many wells to expect - the estimates range from 2,000 to 4,000 - there are 10 permit applications pending in my town alone. And we expect more..... lots more. The concern is that the truck traffic associated with construction of the well pad and the drilling operations will damage local roads, leaving the taxpayer stuck with the bill. It's happened in other towns - one town is coping with over $300,000 in damages and another a mere $80,000 or so - and our town has experienced some road damage already. So now, before the heavy trucks come, is the time to hammer out the details. Which is why earlier this week our town highway supervisor sat down with a group of town council members, planning board members, and citizens to go over language for a potential "road use agreement". The idea behind a road use agreement is that drilling companies and municipalities agree on truck routes prior to any well pad construction or drilling activity. It also lays out expectations for maintenance and reimbursement for road damage. The DEC suggests in their supplementary Generic Environmental Impact Statement - the draft of the rules for drilling in Marcellus - that gas companies ought to consider local road use agreements. They don't require it. But maybe they should. According to the DEC's own document it could take as many as 8900 truck trips to construct the drilling site and drill and frack a multi-well pad with 8 wells. These aren't pick-up trucks either; they're 18-wheelers weighted down with tons of equipment, chemicals or water. Our highway super would like to give each gas company a list of acceptable truck routes. After all, who knows more about the roads than the guy who patches them and plows them? He also suggested that gas companies should complete a survey of all roads they will use prior to any activities. Bridges and culverts are also an issue. Our town has 10 bridges that are large enough to be inspected by the state and, according to one town councilman (who served as highway superintendent years ago), it would take a minimum of $1 million to repair one of those bridges. “It’s not the weight," he says. Rather, it's the combination of weight and frequency of trips that damage a bridges. His solution: have drilling companies build truck by-passes. "That's a relatively inexpensive and quick solution,” he said. Just how many truck trips does it take to build a well? Today the Pennsylvania Department of Environmental Protection (DEP) announced that they have fined Chesapeake Appalachia LLC and Schlumberger Technology Corp. $15,557 each for a 295-gallon hydrochloric acid spill at Chesapeake’s Chancellor well site in Asylum Township, Bradford County. Chesapeake staff notified DEP on Feb. 9 that a 21,000-gallon tank containing 36 percent hydrochloric acid was leaking. The acid was used for hydraulic fracturing. When a DEP inspector arrived at the site, it was determined that the tank had two leaks and was losing about 7.5 gallons per hour of hydrochloric acid. Chesapeake’s emergency contractor arrived that evening and removed free-standing acid from the ground with absorbent pads; excavated trenches to contain the acid; neutralized acid-contaminated soil with soda ash and hydrated lime; and transferred about 11,000 gallons of acid from the leaking tank to two temporary tanks. About 126 tons of contaminated soil had to be excavated, and more than 13,800 gallons of a hydrochloric acid and water mixture were removed from the well site. For most of the farmers in our area - upstate NY perched atop the Marcellus - oil and gas leases have been part of the business since their grandfathers pounded in the first fenceposts. But with a huge reservoir of natural gas beneath their hayfields and forests, and bonus payments heading north of $5500/acre, leasing has become the number one rural land-use issue says Brett Chedzoy, a regional forester with Cornell Cooperative Extension. Chedzoy, who is also a farmer, speaks from experience. His livestock operations have been interrupted not once, but twice for gas pipeline construction projects. Without proper lease protections, farm and forest owners face potential losses in terms of timber, wildlife habitat and other property uses, he says. If a gas company wants to use your land for a drilling pad or as a right-of-way for a pipeline, they ought to pay fair value for all timber removed from your land, Chedzoy says. Even young successional forests have value. An 8-inch tree may have current value only as firewood, but if left for another 50 years it would have significant value as a saw log. As with fields, forest owners need to protect their topsoil, restore drainages, and control erosion. Once construction is completed, the soil needs to be de-compacted. Then the topsoil should be replaced and – especially if the area will be maintained by brush-hogging – make sure that the rocks and stones are picked out. Unfortunately, some farmers say that even when these items are outlined in their leases, the gas companies are not following their directives. Access roads and well-pads are not the only threat to agriculture. According to Chedzoy pipeline right-of-ways (ROWs) are the number-one entry point for invasive species. Once you take out the trees, you create an “edge” – an opening preferred by such invasive species as European buckthorn, multifloral rose, privet, several Asian species of honeysuckle, burning bush, Japanese barberry, autumn olive, swallowwort, Oriental bittersweet, and garlic mustard. The problem with invasive species is that they interfere with native plants and degrade the wildlife habitat. Take buckthorn, for example. It displaces other berry-producing shrubs such as Viburnums and blackberries. and the buckthorn fruit isn't very nutritious for the animals; it causes them to vomit the fruit without digesting any nutrients. This is great for buckthorn dispersal, but not very beneficial for the wildlife. Invasive plants also affect the quality of the forest. The more competitive invasive plants may shade or crowd out the existing seedlings and saplings, changing the character of the woods. Or, like garlic mustard, they may produce chemicals that inhibit seed germination. 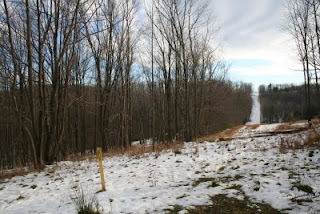 Pipeline right-of-ways also create other problems for forest owners. Landowners needing access to their forests for timber harvest will want to make sure there are permanent crossings for skidders and other heavy equipment. Otherwise forest owners wanting to sell a few trees may find themselves required to provide a “timber bridge”. Trespass liability has become an issue as well. Many forest owners have complained that pipeline ROWs become conduits for ATV and snowmobile traffic. David Behm, NY Ag and Markets Farmland Protection Program Manager, is concerned about preserving agricultural land for future generations. He wonders whether conservation easements will be strong enough to protect farmland in the face of the anticipated natural gas rush. A conservation easement is a legal document that is written in the form of a deed. It permanently restricts the future development of a piece of property for the purpose of preserving or maintaining the scenic, open, historic, agricultural, or natural condition, character or significance of that property. And, Behm explains, it can be modified to allow a well. Thing is, while a single well on a farm doesn’t seem like a huge impact, Behm is concerned about the cumulative impacts of gas development on a given agricultural landscape over time. He believes that access roads to well sites will fragment the agricultural land. "Anytime there’s a road dividing a field, agricultural land is at risk," Behm says. He is particularly concerned about access roads that cut off a couple acres from a larger field – those smaller pieces are at risk for development, Behm says. You can read more about forest and ag-land issues here. When you buy a home in upstate NY, one of the things you do as a matter of course is test for radon. That's because many of the rock layers beneath our homes contain naturally occurring radioactive material - "NORM" for short. And for years the NY Department of Environmental Conservation (DEC) has held the view that normal disturbances of NORM-rock, such as mining and drilling, do not generally pose a threat to workers or the general public. 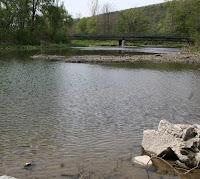 But recent tests of brine from Marcellus wells may change that. 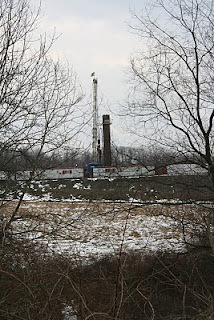 In October 2008 and April 2009 the DEC submitted 13 brine samples from twelve Marcellus wells that were actively producing gas last year. Test results came back with higher than expected levels of NORM. Some brines had levels of radium-226 as high as 250 times the allowable level for discharge into the environment and thousands of times higher than the maximum allowed in drinking water. Radioactivity in Marcellus shale, present as trace elements uranium-238, thorium-232, radium-222, radium-226, and radium-228, is not uniform; it varies from place to place. Over time these radioactive particles decay, with half-lives anywhere from 4 days to 1600 years. And while some exposure to radiation is unavoidable - we're all exposed to a certain amount of background radiation - it doesn't necessarily mean it's harmless. Exposure to some radionuclides – even at low levels – can cause bone cancer, stomach and lung cancers and other health problems. Radon gas, long known to be associated with Marcellus shale, has been shown to be the primary cause of lung cancer among people who have never smoked. So the Environmental Protection Agency (EPA) has established guidelines for certain radionuclides: the maximum contaminant level of radium in drinking water as 5 picocuries per liter (pCi/L), for uranium is 30 pCi/L and for the total alpha emitters is 15 pCi/L. They've also established levels that can be put into the environment: the maximum level of radium-226 allowed to be discharged in wastewater is 60 pCi/L and the maximum levels in soil are 5 pCi/g on the surface and 15 pCi/g in subsurface soils. These higher-than-expected levels of radionuclides does present a problem, given that the current waste treatment option for gas well brines is to transport them to a public wastewater treatment facility. And this past summer the New York State Department of Health (DOH) raised those concerns. According to a report by ProPublica, the DOH sent a letter to DEC warning of public health issues related to disposing of the drilling waste. Wastewater treatment plants will need to do more thorough testing before accepting drilling fluids, noted DOH, and workers may need to be monitored for radiation in much the same way as workers at nuclear facilities. Four of the twelve or so active Marcellus wells in NY are operated by Fortuna, and all four of those wells are located in the little town of Orange, in Schuyler County. Given the relatively low volume of wastewater of the current vertical wells - compared to what’s expected from the horizontal Marcellus wells - and given the lack of local industrial wastewater treatment facilities, it is unclear how the gas companies expect to deal with disposal of Marcellus brines. But one thing is certain: the DEC has not set out any rules regulating radionuclides. Instead, they will run another series of tests, says DEC spokesman Yancey Roy. Rick Kessey, an engineer at Fortuna, agrees that more tests are needed. The DEC’s test results aren’t wrong, Kessey said, but they do seem “out of whack” with previous tests. Meanwhile, the Marcellus wastewater has to go somewhere. In the past, DEC has allowed brine to be spread on roads to help melt snow and keep down the dust. But public comments at DEC hearings and the recent Marcellus Shale summit held in Owego earlier this week indicate that people aren't comfortable with the idea of "hot salt" on their roads. There's another problem, too, says Roy. The DEC is concerned about the potential buildup of radioactivity in scale inside casings, pipes and other drilling equipment. That equipment may have to be monitored, Roy said. In addition, the DEC is concerned about potential accumulation of NORM in the sludge from treated wastewater. Radioactive waste can’t be dumped in any municipal landfill in New York State, so that means shipping the waste to Utah, Idaho or other western states that have licensed disposal facilities. You can read the results of the brine tests yourself in Appendix 13 of the DEC’s Supplemental Generic Environmental Impact Statement -click on Appendices part 1.
added December 21: You can read more about radioactivity in brines in this article from Broader View Weekly.